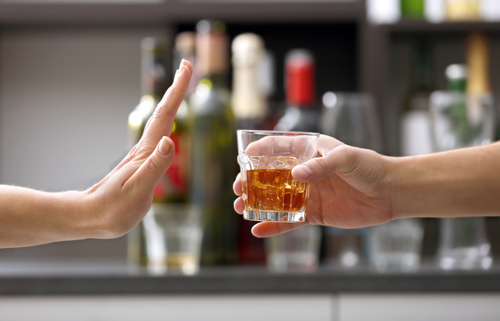 Surprising as it may be, approximately one-third of Americans will have an alcohol abuse disorder at some time in their lives, but not even one-fourth of those affected will seek professional treatment, according to the National Institutes of Health. Although you may think it’s no big deal to knock back four, five, six, or more drinks in one sitting, it very well may be. Learn about the signs that you may be drinking too much and see if they apply to your situation. It’s no secret that alcohol can lower your inhibitions, which can lead to you doing things you wouldn’t normally do. Although you may not dance on the tabletop while out with co-workers, deciding to drive yourself home after drinking can be a risky decision. What if you get pulled over? Or worse, what if you injure yourself or others in an alcohol-related crash? If your driving record is clean, you might think the penalties won’t be that harsh if you do get pulled over for driving under the influence, but that’s not necessarily true. If you view drinking as the main event when you socialize, you more than likely binge drink. Binge drinking is when you consume an above-average amount of alcoholic drink in one sitting, which is considered four drinks for females and five for males. Although you may have intentions of keeping your drink orders to a minimum before going out with friends, that all changes once you start drinking. The one or two drinks you planned to limit yourself to when you were sober suddenly increased to four, five or more, and you’re surprised when you realize you’re feeling a bit tipsy. You’re more than likely struggling to keep your alcohol consumption under control if you tell yourself you won’t drink too much before socializing but you always do. It’s important to note if this is a pattern for you. Certain people, places, and situations can act as triggers that can cause you to overindulge. If that’s the case, you might want to consider seeking out social situations that don’t involve alcohol. If you can’t avoid these situations, find a friend you can call to help you when you’re feeling weak. If you think it’s a good thing when people comment on how much alcohol you can handle, don’t. That likely means you’re drinking much more than the average person. Take a count on how many drinks you have per occasion. If you’re exceeding three drinks, you probably need to make efforts to cut back. Is drinking at the center of your life? Are you always up for another round when other people are ready to call it a night? Do you choose drinking over other activities you used to enjoy? If any of these scenarios sound familiar, you’re likely allowing alcohol to take control of your life. Look for ways to socialize without alcohol. Go to a coffeehouse, exercise with friends or sign up for a crafting or home improvement class. When you start neglecting things that are important to your life due to your drinking habits, it’s a clue you’re probably overindulging. For example, you call into work “sick” because you have a hangover or you had to ask someone else to tuck your kids into bed because you were too unsteady to do so. The more you drink, the more you may need to drink to get the effect you want. This is because you’re building up a tolerance to alcohol. Tolerance can indicate that you’ve become a habitual drinker, which could be a cause for concern. Another clear warning sign that you may be drinking too much is if you don’t remember things that happened the night before the next day. Scientists believe that alcohol can disrupt your memory and cause you not to remember things like how you got home and into your bed. A common question from medical providers is how many alcoholic drinks you consume during a given time period. If your doctor is concerned by the amount that you report you’re drinking, then you also need to be concerned. If you’ve realized that you’re drinking more than is healthy, or even just more than you’d personally like to be drinking, be kind to yourself. There are solutions available, and support there when you need it. Cut back by taking things one step at a time. A healthier life is within your grasp.